The source region of the Yellow River is located in the middle east of the Tibetan Plateau in northwest China. The total area is about 51,700 km2, mainly covered by grassland (79%), unused land (16%) and water (4%). The increasing land utilization in this area has increased the risk of environmental degradation. 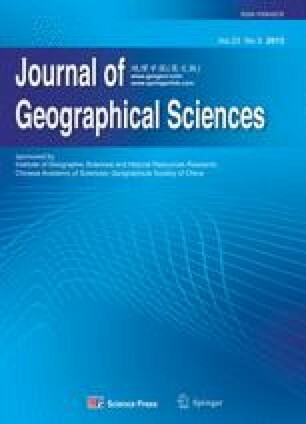 The land use/cover data (1985 and 2000) provided by the Data Center of Resources and Environment in the Chinese Academy of Sciences were used to analyze the land cover change in the source region of the Yellow River. DEM (1:250,000) data, roads and settlement data were used to analyze the spatial characteristics of grasslands degradation. The ArcGIS 9 software was used to convert data types and do the overlay, reclassification and zonal statistic analysis. Results show that grassland degradation is the most important land cover change in the study area, which occupied 8.24% of the region’s total area. Human activities are the main causes of the grassland degradation in the source region of the Yellow River: 1) the degradation rate is higher on the sunny slope than on the shady slope; 2) the grassland degradation rate decreases with an increase in the elevation, and it has a correlation coefficient of −0.93; 3) the nearer to the settlements the grassland is, the higher the degradation rate. Especially within a distance range of 12 km to the settlements, the grassland degradation rate is highly related with the distance, with a coefficient of −0.99; and 4) in the range of 4 km, the degradation rate decreases with the increase of distance to the roads, with a correlation coefficient of −0.98. Besides some physical factors, human activities have been the most important driving forces of the grassland degradation in the source region of the Yellow River since 1985. To resolve the degradation problems, population control is essential, and therefore, it can reduce the social demand of livestock products from the grassland. To achieve sustainable development, it needs to improve the management of grassland ecosystem. Author: Liu Linshan, Ph.D. Candidate, specialized in land-use/land-cover change and physical geography.